Perfectly complementing a sunny Saturday afternoon, Partner's rock theatrics and endless relatability shone brightly from the Fort York stage. Josée Caron and Lucy Niles immediately proved why they rank among Canada's most charismatic performers, strolling out to perform an endearingly earnest "karaoke version" of In Search of Lost Time standout "Playing the Field." Whether they were asking the crowd for a lighter after "Ambassador of Ecstasy" or shouting out everyone attendance from Caron's home province of PEI, the good vibes never left the air. While there were no double-neck guitars in sight, the band expertly translated their maximalist alt-rock to a festival environment. Lighting and fog effects boosted the grandeur of their anthemic choruses and the epic solos that Caron effortlessly ripped from her gold Les Paul. 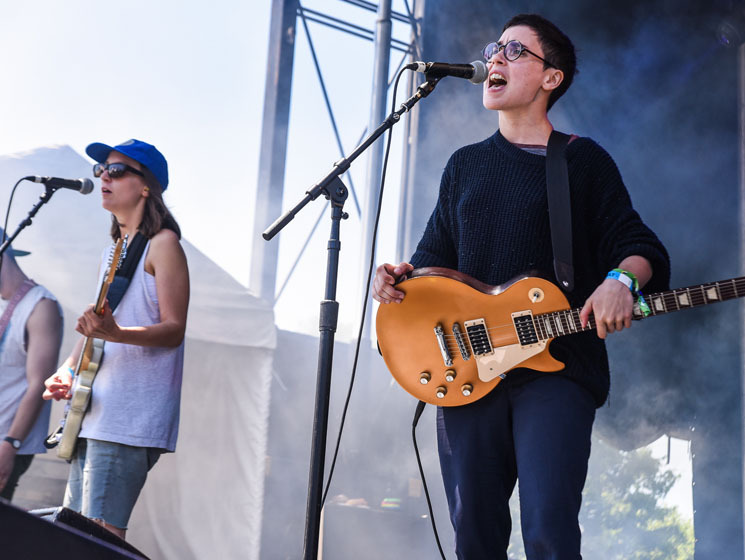 All the while, lyrics about pets, smoking hash, and everyday infatuation grounded their tracks, and even subverted the leery rawk stomp of a new song into a cheeky expression of queer appreciation. Clever, funny, accessible, and energetic all at once, Partner made it clear that they should already be a staple of the Canadian festival circuit.